Smile! Shop at Amazon.com & Automatically Donate to the GCC! 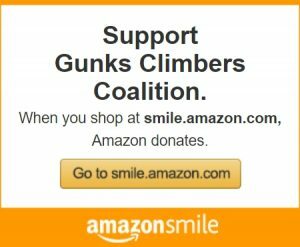 The Gunks Climbers’ Coalition is a charitable organization that participates in AmazonSmile. AmazonSmile is a simple and automatic way for you to support your favorite charitable organization every time you shop, at no cost to you. It works just the same as it does when you shop at amazon.com. Just start your shopping at smile.amazon.com instead of amazon.com every time. 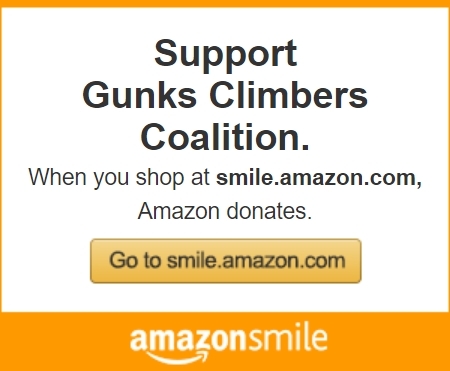 To get started, visit this amazon smile link which will automatically select the Gunks Climbers’ Coalition as the charitable organization to receive donations from amazon for eligible purchases. Now every time you shop at amazon.com, start your shopping with the URL smile.amazon.com instead. Everything works the same. Prime is prime, the purchase prices are the same, your shopping cart still has your items in it, it is still your account. The only difference, and a big difference for the GCC, is that the AmazonSmile Foundation will donate 0.5% of the purchase price from your eligible AmazonSmile purchases (eligible products are marked “Eligible for AmazonSmile donation” on their product detail pages). If you shop via the Amazon mobile app, do your shopping as usual, but don’t check out. Then, login to the smile.amazon.com site through your phone’s browser (or from the desktop) and your items will still be in your cart and you can check-out there so Amazon makes the donation. For more details about the AmazonSmile program, read the FAQ page on the Amazon site. Amazon and the Amazon logo and AmazonSmile and the AmazonSmile logo are trademarks of Amazon.com, Inc. or its affiliates. Content and images cannot be used or published without permission.